If you would like to upload your own costume to this site, simply fill out the submission form. Please provide detailed instructions for creating your costume. I’m sure our visitors would appreciate you for providing them with great ideas. I purchased 2 pairs of rainbow baby-legs and a long sleeve turtleneck. These accompany a handmade jumper. Instructions for the jumper: Measure around the chest of your child. Decide on the desired length of the dress. Start my measuring your child’s chest then add 4 inches. Take this measurement and cut a piece of red fabric that length and 5 inches wide. Iron the red piece of fabric in half then again in half again. Basically now you have a big piece of bias tape. Cut your blue fabric your desired length by 2.5 times your child’s chest measurement. Baste along the long side of the fabric and ruffle it to be the same length as your ironed red fabric. Sew the blue fabric to one of the cut edges of the red fabric. Once you’ve done that, fold the red fabric on the fold lines and top stitch creating a finished look. To finish the dress you can either put a straight seam up the back, add buttons, or Velcro closure. Buttons or Velcro will make it easier to get on and off. The straps are a repeat of the main dress process just with less material. Once you’ve made the straps to the size appropriate for you child hand tack them on. 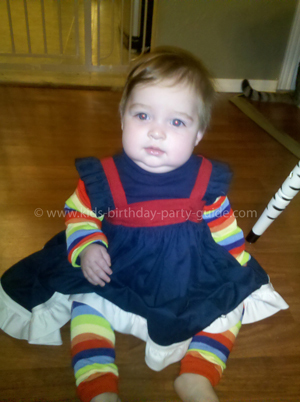 Layer the dress over a blue turtleneck and put rainbow leg-warmers over the arms and on you child’s legs.